Since my last minute craft fair it has just been so apparent that my crafty storage "systems" were failing me . Spectacularly failing me. It had all started so small and easy to manage, but my hoarding tendencies stash has grown and grown until I was finding it hard to know what fabric I had. I also had pretty coloured buckets with all of my general crafty bits in it but they don't get used so often, so I decided it all needs a revamp. I simply need all of the things I use most often to be easy to find, easily accessible to me and close to hand. Here are some before pics, they're actually, technically, after pics as it was after the craft fair tornado had hit. Also imagine if you will, 2 carrier bags with fabric in it and a wicker laundry basket filled with fabric and everything I had been carting around with me for over a week. My wonderful and long suffering Mr polka dot allows all of this madness to take over his side of the bedroom! He has never moaned once! those pink and blue boxes on the shelves hold my fabric, I like to keep the fabric covered as we have a very hairy housemate who is interested in all things crafty. She also once had to have serious emergency surgery after eating thread from my sewing machine. So now I am super careful to keep it all tucked away. 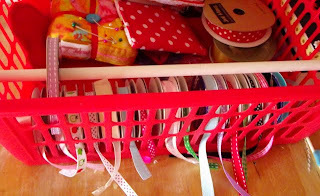 My favourite basket that joins me on all crafty outings, filled with loads of odds and ends from my crafting whilst sitting at the fair. this basket held ribbon and bits and bobs before it became a free for all . I tried to think of the things that I knew I liked and the things that worked. I love using old cans to hold pencils, stationary and scissors. I even have one stuffed with glue sticks. 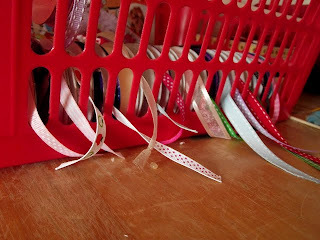 They are easy to decorate, you can cluster them as I have, or move them around as you need to. And best of all they are free! I also love using jars, again they are free, easy to pretty up with ribbon and fabric or paper. They are also great because you can see at a glance what is inside and where everything is. I think jars are going to be used A LOT throughout this project. Next was my large ribbon problem, I need to keep it all handy and organised. I searched pinterest and came up with a few ideas. I love to be able to achieve things with little or no money, so I shopped around my house and found a solution hiding in my pantry. It's pretty self explanatory, a dowel rod and a plastic basket. Thread the spools onto the dowel and then thread the ribbon through the slits in the basket. everything stays separated and organised. For now there is also a little etra storage in behind the rolls. 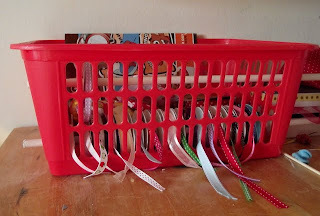 This is great as it holds my larger rolls of ribbon and also my business cards and pin cushion. 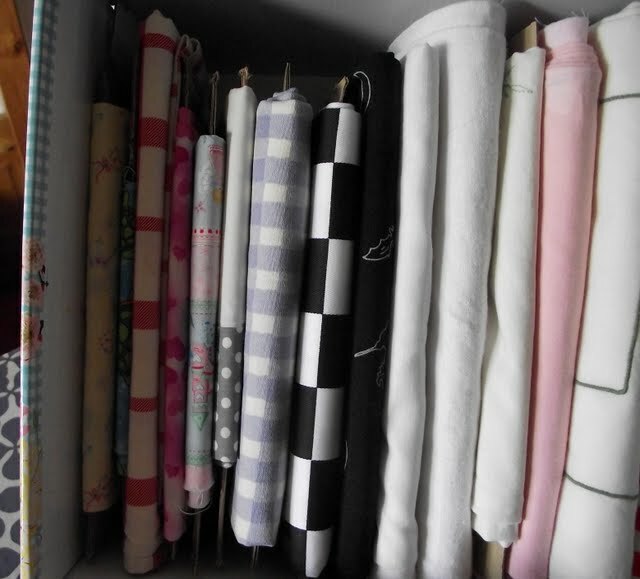 I also re ironed and re-folded all of my fabric, it is now wrapped around cardboard inserts and stored in my boxes, sorted by amounts. It is so easy now to see what I have and it all stays wrinkle free. These little rectangles of cardboard which I simply cut from cardboard boxes, have made my life so much easier and ever so happy. I LOVE jamjars and recycling items for storage. My table tidy/tool organizer is a cutlery drainer. I love the ribbon basket - fantastic idea. 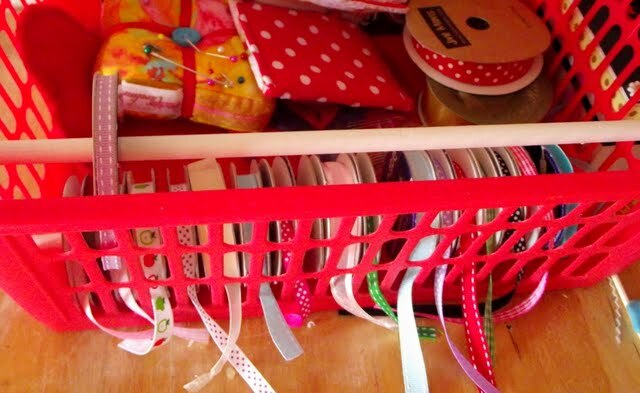 Wow - I really love your crafty space - it looks so much tidier than mine and you have devised some pretty yet functional storage aareas.